The Illinois debt saga continues. The state operated without a budget since 2015. In June, just before their fiscal year end, both S&P and Moody’s downgraded Illinois’ credit rating to one level above “junk bond” status. “Legislative gridlock has sidetracked efforts not only to address pension needs but also to achieve fiscal balance, allowing a backlog of bills to approach $15 billion, or about 40% of the state’s operating budget. During the past year of fruitless negotiations and partisan wrangling, fundamental credit challenges have intensified enough to warrant a downgrade, regardless of whether a fiscal compromise is reached in an extended session. …By our calculation, the state’s unfunded pension liability for its five major plans in aggregate grew 25% in the year ended June 30, 2016, to $251 billion. Fox News reports the Governor agreed. “Illinois bonds surged as the legislature moved closer to ending a record-long impasse over the budget, reducing the risk that the state’s bond rating will be cut to junk. The Illinois House also overrode the veto. Whoopee! Illinois now has a budget. Wonder if it included overtime pay for working on the July 4th weekend? Has Illinois fixed their budget crisis? “S&P Global Ratings called the weekend developments a “crucial step” toward ending the stalemate. Bloomberg reports Citigroup sees Illinois Bonds as an opportunity for “BOLD” investors. “That may mean it’s a good time to buy, according to Citigroup. …The fifth most-populous state has “strong fundamentals” and the power to tax and grow its way out of the financial hole, the bank said in a report to clients this week, citing the diverse economy and strong legal security backing its debt. …Illinois hasn’t missed any bond payments and state law has required it to continue making monthly deposits to its debt-service funds. Moody’s disagrees, “So far, the plan appears to lack concrete measures that will materially improve Illinois’ long-term capacity to address its unfunded pension liabilities.” On July 5th, Moody’s announced they were putting Illinois under review for another possible downgrade – to junk bond status. Buying IL debt, BOLD or Bad? Meaningful spending cuts are an unnatural act for Illinois politicians. They continue to kick the can down the road leaving a bigger problem for future generations. Even if their credit rating is not changed, their problems will multiply. …The 2011-2014 Illinois income tax increase triggered a significant flight of income-earning power from the state. Illinois lost more than $14 billion of annual adjusted gross income during the four years of the tax increase, the IPI said. …But there’s more than money management at issue, say observers. Amending the State Constitution to enact pension reform has not happened. “…Friday’s ruling would cause her to likely have to cut payments to the state’s pension funds, state payroll or payments to local governments. Payments to bond holders won’t be interrupted”, she said. When the politicos in Detroit could not find a solution for their fiscal woes, they filed for bankruptcy. The court appointed a referee to oversee the process and do the dirty work the elected representatives were unwilling or unable to do. “…Friday’s ruling by the U.S. District Court takes the state’s finances from horrific to catastrophic,” Mendoza said. In court arguments Wednesday, patients’ attorney David Chizewer likened the situation to a misbehaving child provoking a frustrated parent. Adult behavior is an oxymoron when it comes to Illinois politicos. Risk vs. Reward – BOLD or bad? 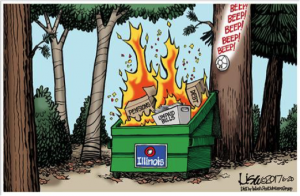 Illinois burns and pundits are looking to profit. Is this a good opportunity to invest retirement savings? What’s the reward? Interest rates for 10-year Illinois General Obligation bonds are approximately 2% higher than AAA rated municipal bonds. $10,000 in Illinois bonds would annually earn $200 more in interest than a top quality bond. Will Illinois continue to make their interest payments? In 10 years will you receive all of your principal back? How much loss will you take if you sell the bonds before maturity? Will congress allow Illinois to file bankruptcy? Will the federal government bail out states that go bankrupt? With the judiciary intervention, might they try to renegotiate with bond holders? If Illinois does not default, investors should be considered BOLD. Is it worth an extra 2% to take on the high risk? Let the speculators play the game, there are too many better/safer places to invest retirement money. Stay away from funds investing in Illinois debt – it is toxic! Even speculators should hold off. Sounds like a junk bond rating is coming soon! If they don’t go bankrupt and default, in 10 years Illinois will be looking for a “bigger fool” to lend them even more money to pay off maturing bonds and finance their continued deficit spending. Let’s hope the politicos don’t use any more tax dollars bailing out BOLD banks. Bankruptcy serves a good purpose, it punishes people for making BAD decisions. It’s about time some sanity came back into the bond market. Retirees should observe, not participate, when it comes to IL debt. We put 7,075 miles on the van during our summer trip. We had a wonderful time, highlighted by seeing ALL of our grandchildren. We went to 40 baseball games in Indiana. We just ordered a cool, collapsible wagon. Wish they had them when our kids were young. We no longer lug coolers, lawn chairs, snacks and umbrellas from the car to the field. These are really handy and fold up nicely. I have several uses here in AZ for our new accessory. When I am done, I can hang it on the garage wall. Thanks again to regular readers who shop Amazon through this LINK. We get a small stipend and it helps us keep our website FREE. We were in Tucumcari, NM (almost home) when friend, and former colleague, Jeff C. sent me a text encouraging me to post some photos of our trip. It never dawned on me that readers might have an interest, so we began snapping away. 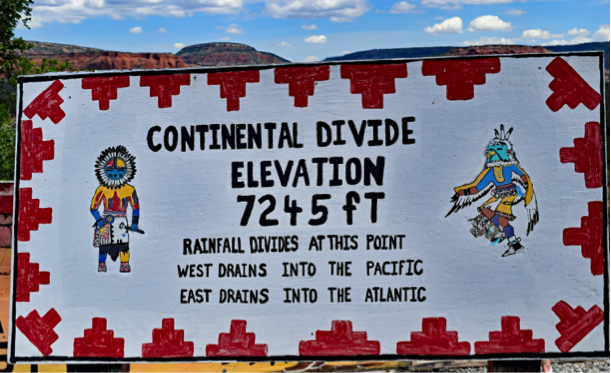 It’s a beautiful drive from Albuquerque, NM to Flagstaff, AZ going over the continental divide. I had to crop it; the bushes in the foreground were blurry as the speed limit was 75mph. I was pleased with the sharpness we achieved while rolling down the highway. I-40 parallels a major east-west railroad route. The road you see in the bottom of the photo is Route 66. Just for fun, we drove on it for a few miles. If you have never driven across America, I suggest you put it on your bucket list, take your time and have fun. Please drop me a note if you enjoy the photos and want me to continue to post them. dennis@milleronthemoney.com I love to hear from our readers. Of course we enjoy your photos. It allows some of us to enjoy through pictures what we may never experience in real life. Thanks for sharing.